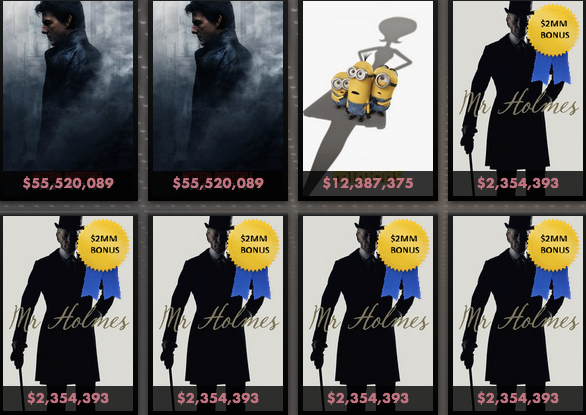 In a week where I thought the Best Performer bonus was between three films (“Minions”, “Ant-Man”, and “Southpaw”) and I hedged my selection with two of them, a film without a ProBoxOffice.com prediction at all (“Mr. Holmes”) took home the Best Performer bonus. The performance of “Mr. Holmes” this weekend wasn’t a total surprise since it gained 212 screens but it was hard to predict given the difficulty of obtaining that key bit of information before the weekend started. And I completely missed it. As a result, I fell to 4th in the “Started Week 6 League” and to 14th in the Rich Eisen Show League, but this week I unleash a new weapon. It turns out, the big packing part of my nerdy bin packing Monte Carlo simulator works really well. The Monte Carlo part, not so much. That’s because what matters more than random variation in FML is specific variation. What matters more than anything when it comes to scoring well is guessing Best Performer and in order to do that, analyzing variation among all movies for a given week doesn’t influence that decision. Instead, analyzing variations among 2-5 movies that are Best Performer candidates does. The way I structured my Monte Carlo simulation I put equal weight on the randomization of all movies and what is more helpful is to examine variations among those key Best Performer candidates. 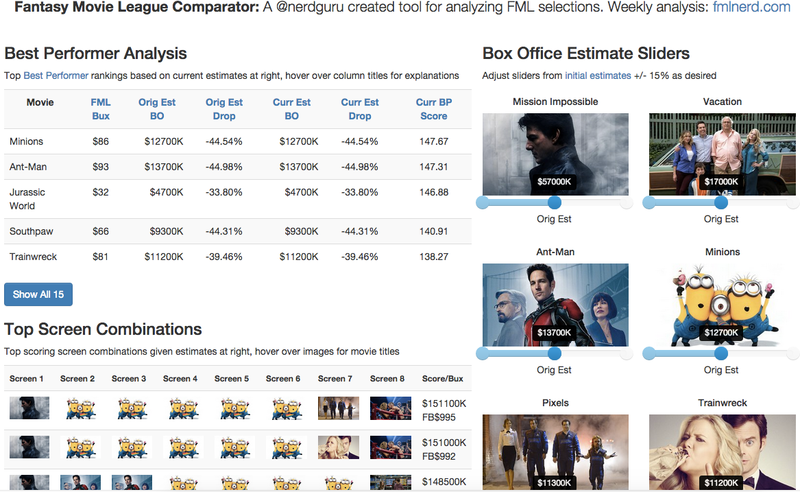 I’ve been running my simulator over and over again varying the estimates for those key movies each week on my own. More than once I winched I had sliders to play with so I could immediately see the impact of one variation on the overall picture. So that’s what I built. Above is a screenshot of my nerdy bin packing estimate comparator, which you will be free to use when I release it to the public later this week. It comes preconfigured each week with estimates based largely on ProBoxOffice.com but as you move the sliders on the right, both the best performer table and the top scoring combinations table will update to reflect your new estimate. My hope is that it will prove to be a useful tool for anyone wanting to do deeper FML analysis on a wider variety of specific variations. More to some Wednesday on this topic. This week we have four new titles at our disposal — including the last big movie of the summer, the “Fantastic Four” reboot — and for the first time since I’ve been playing, no selections that cost less than FB$16. Usually there are a couple under FB$10 that you can fill in easily with that eighth screen so you can load up on the more expensive films, but that’s not the case this week. This development should shake up the bin packing quite a bit this week and it will be interesting to see how that plays out.